Terms used to define kite parts of a dual line stunt or sport kite. The upright spar in the middle is called “spine”. APA-Connectors are also called “spreader connectors”. For ordering parts please specify diameter and length of spar. 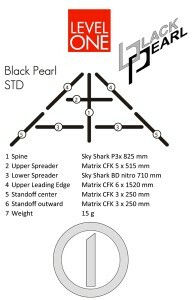 All Level One kites come with a data sheet to include all measurements you need. If you require a copy of your Level One kite’s details, please contact us. This entry was posted in FAQs, Updates and tagged kite anatomy, kite fittings, kite parts, kite spares, kite spars, kite terms by dragonfly.